Unfortunately, my coworkers didn’t appreciate it. It got erased a day later and nobody made a single comment on them. 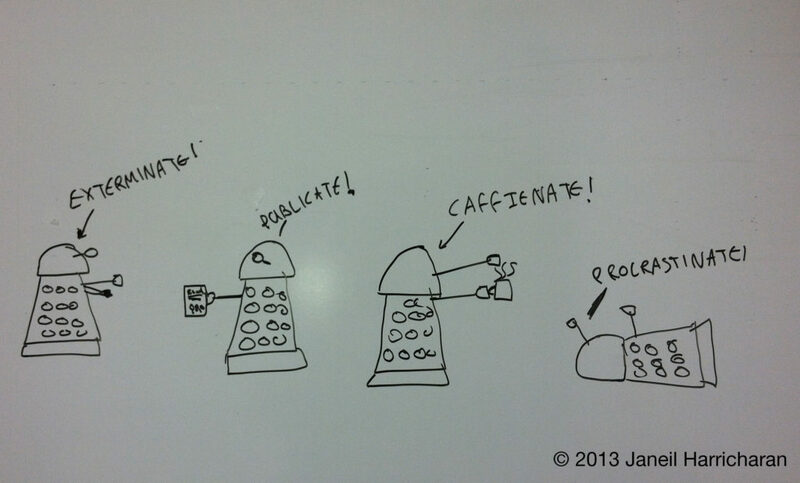 I never drew anything on their big whiteboard again. I had just started playing Borderlands 2 on Xbox. Me being the creative fellow that I was, I drummed this up after falling in love with a long-barreled pistol in the game. 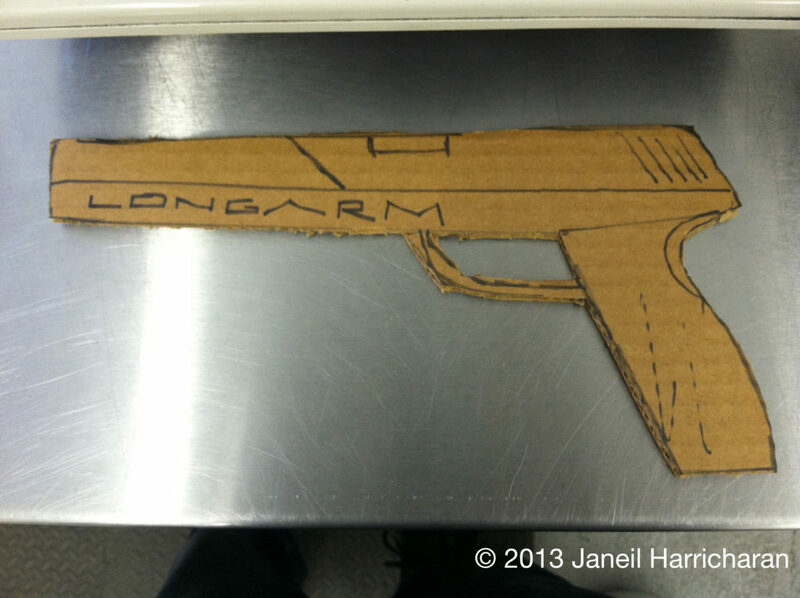 That particular instance it was called the “Longarm”, hence the name. I actually had a trigger but it tore off very easily when cutting the hole out. Oops. 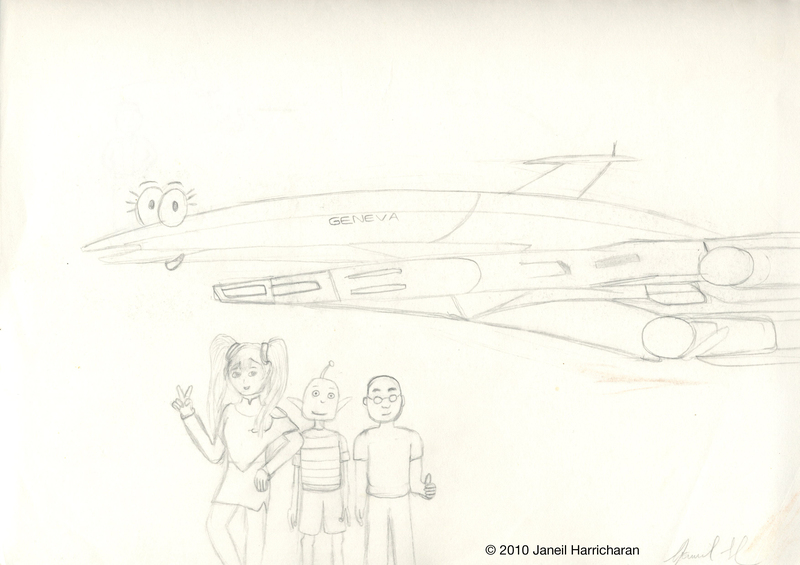 Originally this was a notebook sketch dating back to 2009, so I apologize for the quality of the art style. To make a very long story short, I ran across a lady in school, but she was quite empty-headed and lazy to put it mildly. The breaking straw was that she had asked me to help her get a school assignment off of a library database, but it turned out that she was expecting me to do the entire thing, not just give her directions on how to retrieve it herself. I started to distance myself from her and stick to more of my online friends even more. My feelings towards the situation was summed up in this picture; intelligent, well-read women confronting said woman and squaring off against her. I had stopped drawing people I had met in real life by then, but this was a special exception. And moreso when I brought it to life in 2011, even getting to use my sibling’s Mac and my Bamboo tablet. Why digitally color it so many years later? It turns out she started going to ETSU too, and was starting to try to pull the same shenanigans again. While this time around I had real people to get support from, the initial sentiment still held true. EDIT 2013: Years later, I related this story to a fellow classmate our final week of class. He laughed and told me “Raine and Sheena have to go save their world! They don’t have time to be your personal mafia.” As such I find his description very fitting, and am renaming the post to reflect it. See? Your input makes a difference sometimes. This was a fun bit that happened. 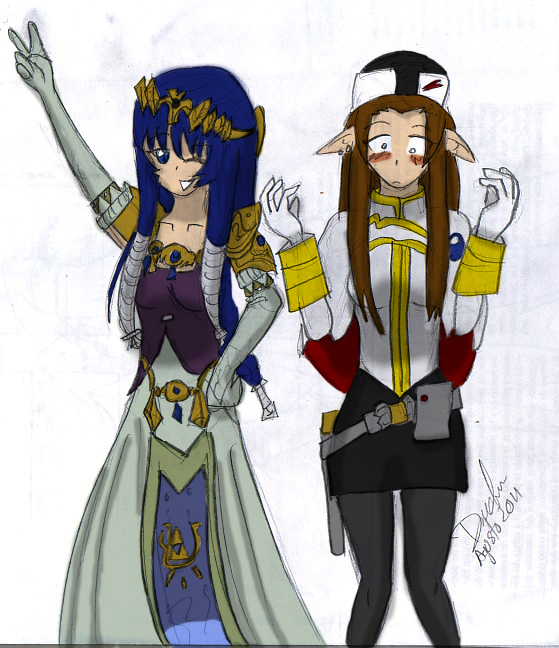 A semi-buddy I follow on deviantART did this request of Yurika and Twilight Princess Zelda swapping their clothes, much to each other’s humor. Her art program was screwed up to digitze it, so I decided to go color it myself with my newly-acquired coloring skills. Thanks, DIGM. Original sketch by Dialirvi. Coloring by me. 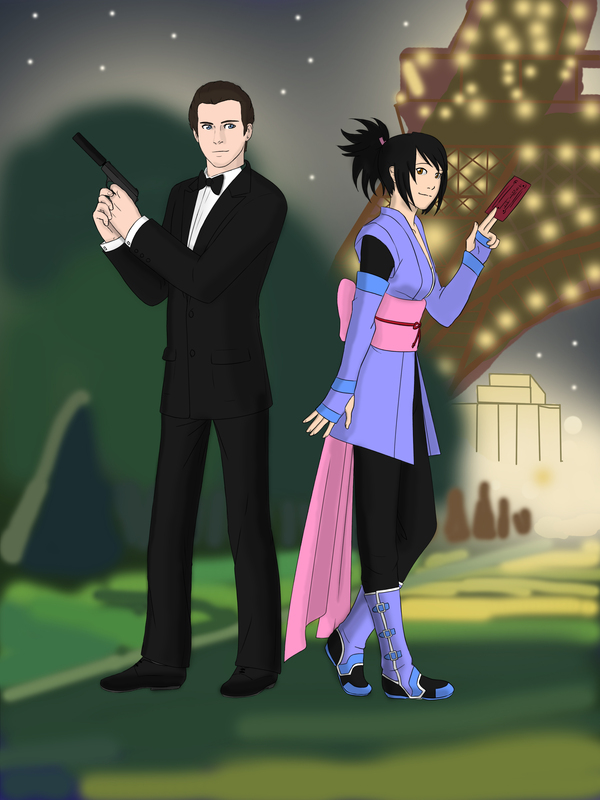 Just some messing around with MMD after getting hooked on the “Quantum of Solace” 007 movie. 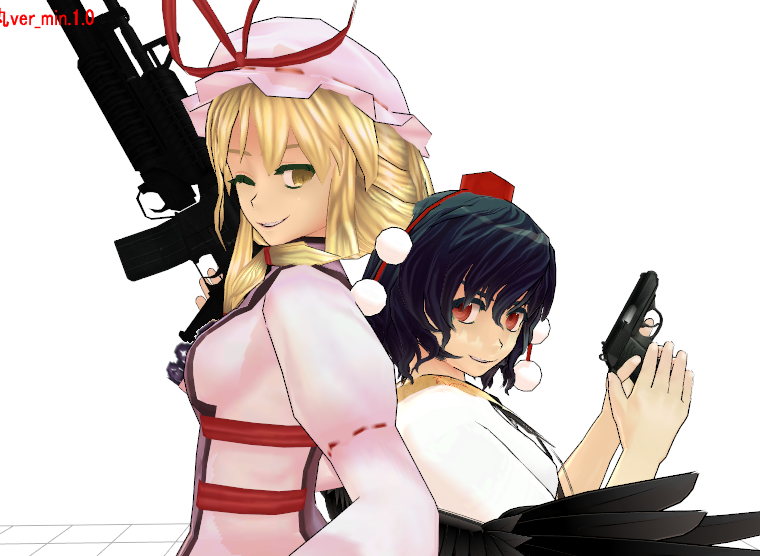 Obviously Aya is our aspiring James Bond in this scenario with Yukari being the sidekick. Wasn’t able to grab a proper screenshot at the time, but still enjoyed the setup. Back in college when I had a bit of money and was full-blown fanboy of the Mass Effect franchise, I commissioned this amazing artist to do a crossover between the Tales of Symphonia and Mass Effect universes. The result was Commander Shepard coming to Sheena’s rescue. Even up to this day it still gets quite a few laughs. Apparently it’s one of the better ideas for crossovers I’ve come up with. And it was done just in time for Valentine’s, too. This was real great to work on, I got to put my tablet to use coloring this awesome piece by ThePockyMonster! 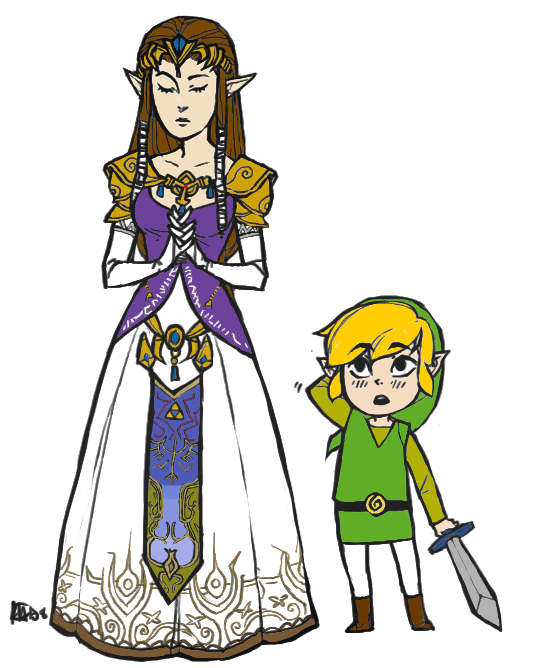 The Toon Link eyes are spot on, and Zelda looks pretty cool herself. Lines done by ThePockyMonster. Coloring by me. 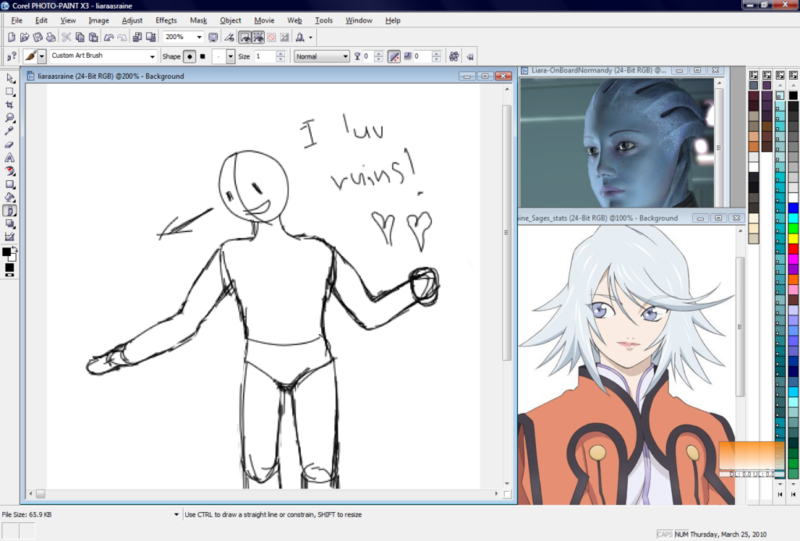 I may have not played Mass Effect, but I have a pretty good idea on what it’s about. And honestly, I love the storyline. But you know what’s even more better? 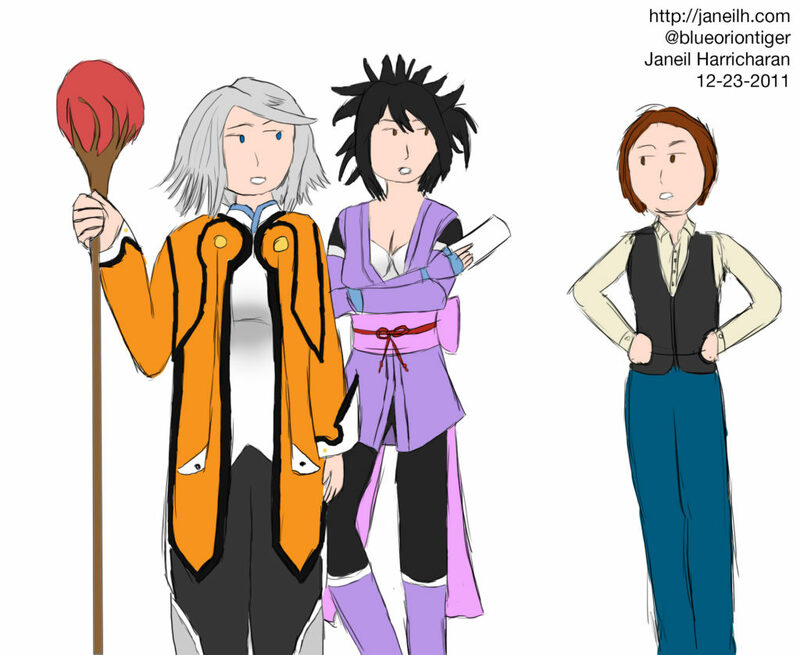 Tales of Symphonia + Mass Effect. With me getting into the swing of hopefully doing graphic arts or such this year at ETSU, I’ve upped doing art a whole lot more, in hopes to get more practice. As such, I decided to do an ambitious project; not only create a crossover fanart piece, but freehand it completely instead of draw on paper then transfer. I’m using Corel PhotoPaint for the time being, as that’s what I’ve always used for all my digital art since 2007. But you get a good view of my layout for this project. Best of luck for me getting somewhere with this. This was a fanart I churned out in the last week of December, hoping to give some sort of visual to go along with the Solaria Novus. I head teamed up with a bunch of people off of Youtube, and that’s what actually got me started to go down the path there to do things. Who knows? I can’t wait to see the final project done! Either rate we have the main characters of the audio play; Ruri from the new Nadesico movie, Lloyd Nebulon from Lloyd in Space, Fillmore from his show’s sake. In the back is the old Normandy from the first Mass Effect game, given the Airport Mania treatment with the face for added effect. One of these days I may color this. But for the time being, it’ll remain in its infamy the way it is; a sketch.